With the school year in full swing now, social skills can be a challenge in any classroom. This week’s pick helps students know the social code and standards expected at school by providing visual cues and checklists to help them both understand and regulate their own behavior. 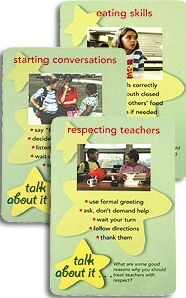 Know the Code at School Social Skills Cards illustrate 50 social skills in typical school scenarios. Each card shows a skill with a relevant photo, lists five sequential steps to accomplish the skill and suggests a talking point. The cards are great for games and role plays at an elementary or middle school level. 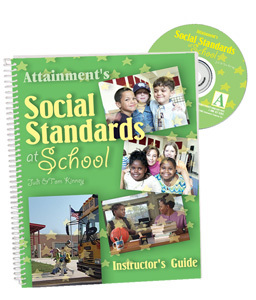 Social Standards at School is comprised of fifty-three social skills that are involved in a typical school day. From waking up in the morning to going to sleep at night, this guide is a great resource for working with higher functioning children. The book covers skills such as getting ready for school, classroom behavior, transitions, peer relationships and common etiquette. Each skill provides teacher guidelines and a student self-monitoring page. Each of the skills is then broken down into five steps and contains guidelines which include an objective with five benchmarks, problem-solving checklist and a script for teachers to follow when reviewing the skills with students. Self-monitoring pages help students keep track of their social progress. By using this concise record keeping system, users can integrate the teaching of social skills into IEP’s. This week, help your students develop their social skills independently and save 15% on Know the Code at School and Social Standards at School by entering the Promo Code BLOGSS12 at checkout. *Offer expires on October 2, 2012 at 11:59 pm EST. Not compatible with any other offer. Be sure there are no spaces after the Promo Code when you enter it at checkout. Written by: Different Roads to Learning on September 25, 2012. This entry was posted in ABA, Academics, autism, autistic spectrum disorder, Behavior, Difflearn Promo Code, Pick of the Week, Social Skills and tagged autism, autism education, School routines and rules, School rules, social skills, special education, teaching tools by Different Roads to Learning. Bookmark the permalink.